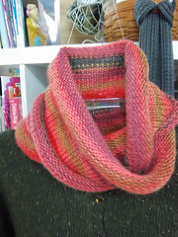 A cottony version of a favorite cowl! Just large enough to come down on the shoulders a little. What a great housewarming gift or hostess gift! Linen is soft, absorbent, and machine wash and dry. 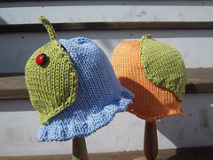 Never enough cute baby hats to go around! One skein of Euroflax Linen Sport! Nice and cool. 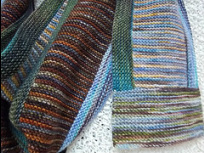 A very simple drop-stitch pattern uses two skeins of Filatura di Crosa Tempo. Lovely tweedy colors that go with everything! 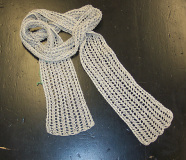 Wear around shoulders or draped around neck like a cowl. Pattern is for sale in shop. Wear it wrapped around or hanging down - either way, linen is lightweight and soft, even on a warm day! 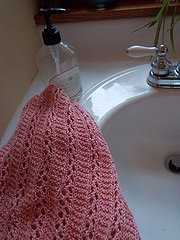 Pattern is available on line through Ravelry; Baktus and Lacy Baktus! 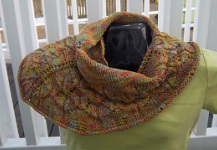 Made with one skein of Noro Taiyo Sock, a cottony blend with great summery colors! 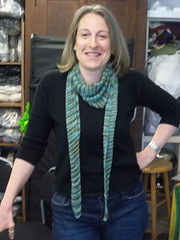 Fun to knit and great to wear for spring and summer in lightweight cotton blends. Brown Sheep Cotton Fine and Noro Taiyo Sock. This is a great "car project"; just pick out 5 colors and knit, knit, knit. Done in garter stitch, you can make the most of some single skeins! Just two skeins of Liberty Wool make this great simple cowl. Wear it "single" around your neck, or double up to keep warm. Makes a great gift!